A very late start time of 14.07 on stage 10 of the 2015 Dakar Rally pitched Team SP FiFTYONE riders Simon and Llewelyn Pavey out in the Argentinian elements on an already technically demanding course. 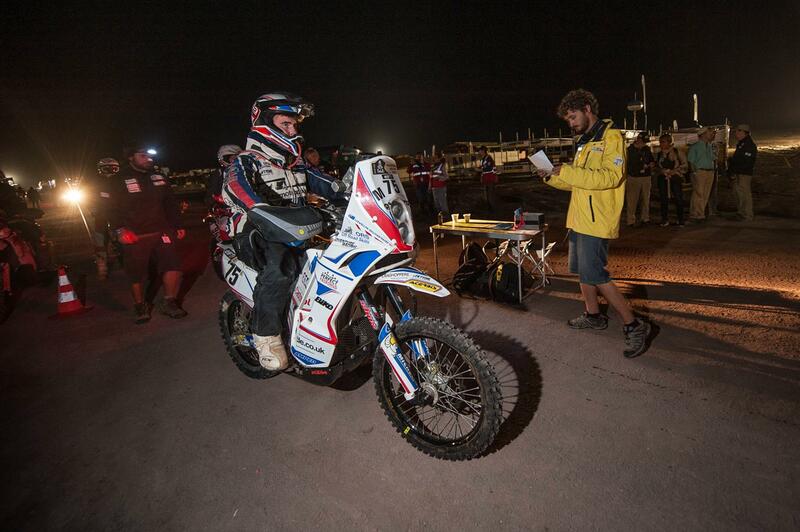 Bike problems and altitude sickness made the stage epically long, even by Dakar standards. Things were going well for much of stage 10 until yet another bike problem caused by crossing the very wet Uyuni salt flat two days ago. They eventually reached the overnight bivouac at 4am, almost 24hrs after they had begun their day’s riding. Riding together all day again they finished in 78th and 79th, with Llewelyn just ahead of Simon. Their overall standings are now 65th and 66th. “We’ve definitely made it a proper Dakar, whether we wanted to or not! We set off for the start of the first leg of the marathon stage in the early hours of the morning and it was unbelievably cold, minus nine. We’ve got some really good kit but still we were so cold it was ridiculous. “I wasn’t feeling too great either after four and a half days at altitude in a row. We’d slept up there twice and I had a lot of chest pains but Llel ended up worse today. We came across a doctor’s car and they let us get in and warm up for a bit. We both had some oxygen, a couple of bottles of electrolytes and we lost time there. “We rode on and when we got to the re-fuel, pretty much the highest point of that day (almost 5000m) Llel was pretty bad. We carried on because it was down hill from there but by the time we got to the start of the special he was in a really bad way with it. “Doctors put him on oxygen, then a drip and we were there for a long time. We ended up taking the start of the special after everybody, literally after the last truck right at the back. “The start of that stage was so beautiful, a fantastic trail and really nice to ride. We just started riding together at our own pace and began passing some trucks, which was insane! “It was all kind of going alright, a tough day at the office but we thought things were all going to turn out fine. But then after the re-fuel my bike just died – it was my turn this time. So it was the same thing as last time: we chased problems round the bike, we had a load of Bolivian spectators with Chad Reed t-shirts shouting “we ride motocross!” at us and full of beans. They were super-enthusiastic and super-unhelpful because they kept trying to fix things that didn’t need fixing! “It took an hour and half or so but we got it running again, it was salt in the main switch this time. That salt was unbelievable the effect it had. You just find it and chase it through the bike. Someone was just telling us KTM found salt on the valves of one of their bikes!